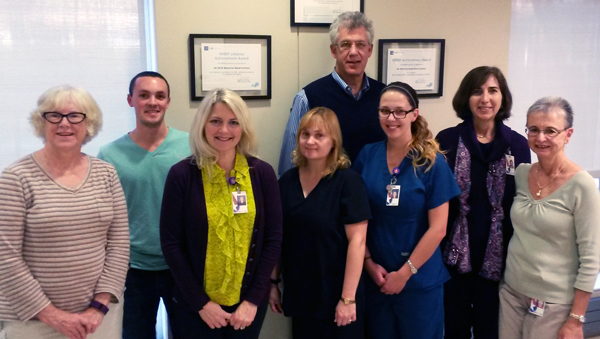 MBC’s HPC team includes (pictured left to right), Dr. Betsey Perry, Nicholas Bukoskey, Anita Hove, Julie Budach, Dr. Jed Gorlin, Tessa House, Dr Nancy Van Buren, and Wanda Koetz. Memorial Blood Centers (MBC) was recognized by Be The Match with the 2015 Partnership Award for our ongoing support and dedication to helping save lives. On behalf of MBC, Dr. Betsey Perry accepted the Partnership Award at Be The Match’s Council Meeting this past fall in Minneapolis. MBC plays a vital role in helping Be The Match connect critically ill blood cancer patients with life-saving transplants. We operate one of only two collection sites locally that performs peripheral blood stem cell (PBSC) donations. PBSC, blood-forming cells found in bone marrow, are collected by apheresis donation—a process that can take 8 hours. This collection is performed by specially-trained staff on our Hematopoietic Progenitor Cells (HPC) team. Our partnership with Be The Match has grown since the 1990’s, when MBC first became a member donor center. Today, our relationship continues to include providing phlebotomy service for confirmatory testing, performing infectious disease testing, and blood drive sponsorship. From donor recruitment to laboratory staff to collections, many departments contribute to making our partnership a success. Watch the award presentation here. Did you know? In 2013, MBC was recognized by Be The Match as a Performance Leader for meeting service and quality indicators for donor care, product integrity, data submission, and overall service. MBC partnered with the Minnesota Timberwolves to help maintain a stable blood supply around the holiday season. The week of Thanksgiving, the team hosted a blood drive at the new Mayo Clinic Square—it was a slam dunk reaching 148% of goal! Renee was the first to donate blood at the Timberwolves blood drive. Achieve Minneapolis, a nonprofit created to help Minneapolis high school students be college ready, invited Twin Cities’ professionals to share their careers with students. Representatives from MBC, Kyle Akervik, Regina Newton, and Phil Losacker spoke with students at Washburn High School in December about their chosen careers and highlighted all the great opportunities at MBC. MBC employees Melina Hough, Katie Reynolds, Rachel Paavola, and Jeff Allen, along with volunteers Sarah Rutherford and Lori Richards pose for a photo after wrapping dozens of gifts. 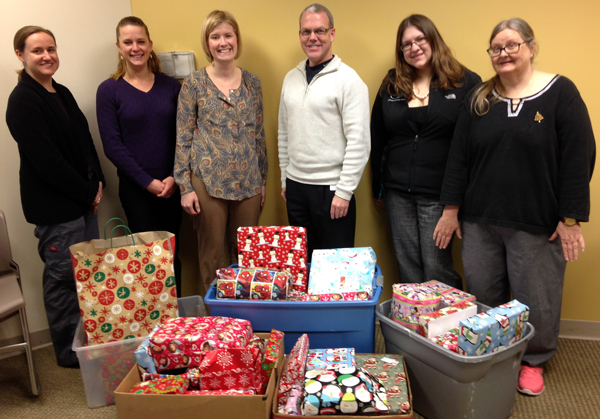 ‘Tis the season to give and this past Christmas, staff in the Northland adopted a family to help spread holiday cheer. Northland staff came together to collect and donate clothes, toys, gift cards, and more to help the special family have a brighter holiday season. To help raise funds, staff held a bake sale and a party to wrap all the gifts. The need for cheer for this family made its way down to the Metro and some staff couldn’t miss the opportunity to give back. 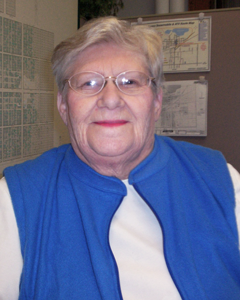 Maggie Schneider, Donor Recruiter, volunteered to coordinate efforts with Metro staff. Combined, MBC staff raised more than $600 for the couple and their three grandchildren. Click the play button to watch on Minnesota Vikings website. Fifty people stepped up on December 1 to donate blood at the Minnesota Vikings blood drive at the Radisson Blu at Mall of America. Those who presented to donate were eligible for many giveaways, including a meet and greet with the Minnesota Vikings and a chance to win 1 of 10 pairs of tickets to a Minnesota Vikings game. Congratulations to our Meet and Greet winner Debbie Yerys! She has 47 lifetime donations with MBC. Congratulations to the following presenting donors who won a pair of tickets to the Minnesota Vikings vs. New York Giants game: Patti Sandvik, William Milne, Dave Rauschelsfels, Jason Casavant, Alison Kimber, Chris Christensen, Chance Gilliam, Amy Strabala, Michael Guinee, and Bob Kobler. Congratulations to long-time blood donor advocate Jeanne Kucera on becoming the first-ever recipient of the Roslyn S. Jaffe Associate Award. 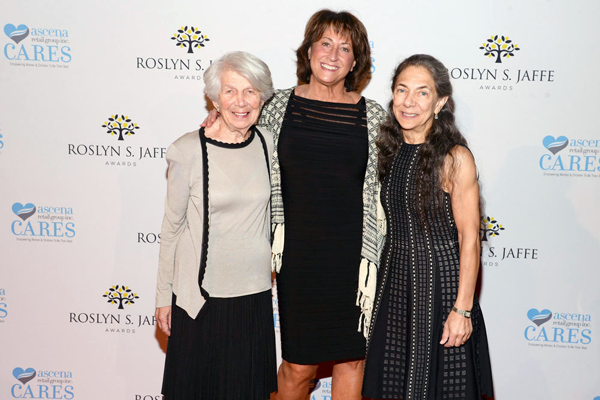 The Roslyn S. Jaffe Associate Award honors everyday heroes of the Ascena Retail Group Inc. who give back to their communities. 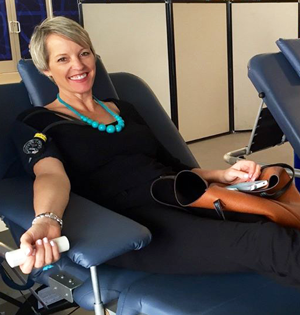 Maurices has been giving back to the community through hosting blood drives since 1997. In total, employees at Maurices have donated 964 units of blood. Q. What is your best tip for coordinating a successful blood drive? A. My blood drive is local and I have a chance to get to know everyone who comes to donate and they know me. I encourage them to let me know if they cannot make it to the drive, so I can fill their time slot and maintain a full schedule. I also call everyone the evening before the blood drive to remind them what time their appointed time is—all 84 of them! Q. 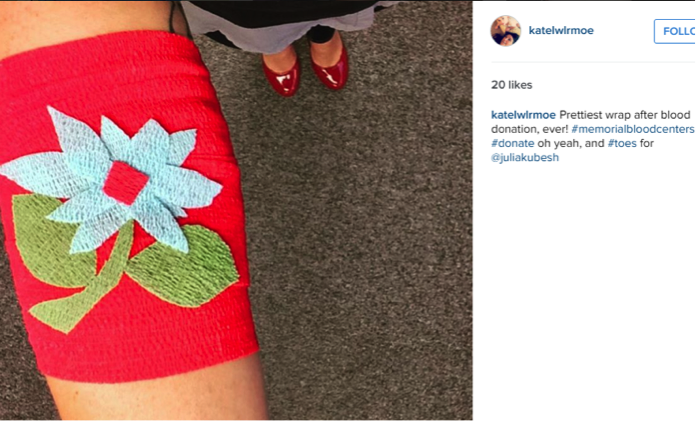 How often do you host blood drives? A. I host a blood drive every 67-68 days in the Aurora Community. Q. What’s your favorite part about partnering with MBC? A. The lives we can help save! We don’t know who we are helping, but blood donations could help me or you one day. A. Besides the blood drives, I also coordinate a group who makes bandages, and kits for newborns, AIDS, and hospice patients around the world, I am a member of the local Hospital Foundation, and coordinate volunteer efforts in Aurora to maintain flower beds, “Spruce Up Aurora”. I also enjoy jigsaw puzzles. A. I don’t have one favorite food, it depends on the season and holiday. Q. Where’s your favorite place to go in town? A. I enjoy going to various places, but mainly I like to be around people and to help those who need assistance, locally and around the world. Q. What is your blood type? A. My blood type is O+. Here’s a snapshot of what’s been happening on our social media pages. Click on any image to see the live post! Click the play button to watch their story on KBJR's website. One in three people will need blood in their lifetime. For one family in the Northland, the statistic is even higher. 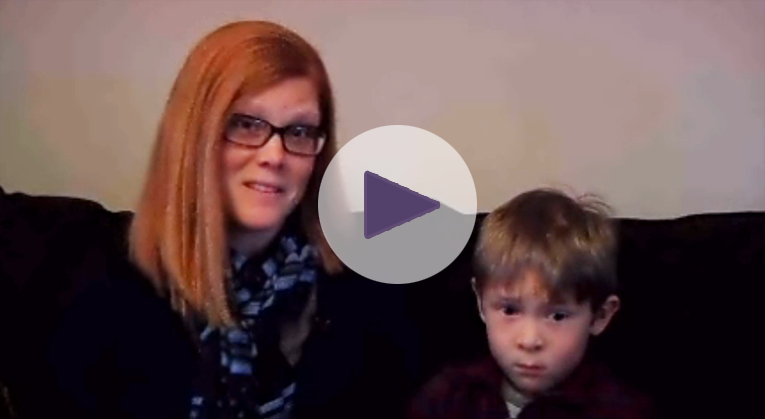 Blood transfusions helped Kristin Montgomery sustain life after giving birth to her son, Evan. Then, 16 months later, Evan needed blood transfusions during an open heart operation to fix his congenital heart defect. Kristin and Evan shared their story with KBJR to encourage others to spend an hour making a life-saving difference by donating blood. 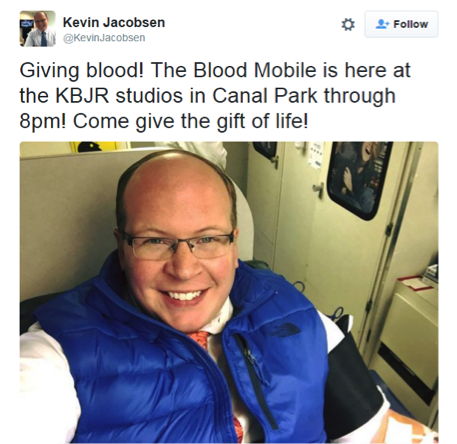 Efforts by Kristin, Evan, and the KBJR team, along with extra giveaways contributed to the blood drive on November 30 achieving 140% of goal! Did you know? 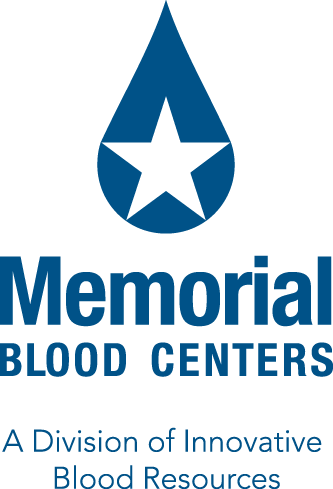 More than 10% of blood Memorial Blood Centers collects is from students at high school and college blood drives. 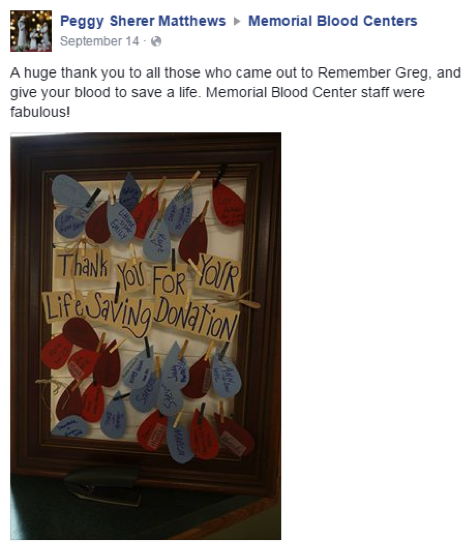 Memorial Blood Centers’ first blood drive in Hutchinson exceeded its goal—achieving 115%! The blood drive coordinated by John and Kathy Sanken was held in honor of Shawn Bollinger, a Litchfield man, who is waiting for a lung transplant. The Sanken’s encouraged local businesses to donate coupons and other goodies as a giveaway for all presenting donors at the August blood drive held in downtown Hutchinson. 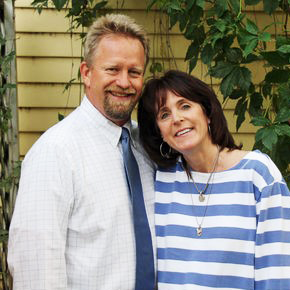 John and Kathy Sanken host a successful blood drive in Hutchinson. 39 people registered to donate blood in honor of Shawn and 31 units were collected. 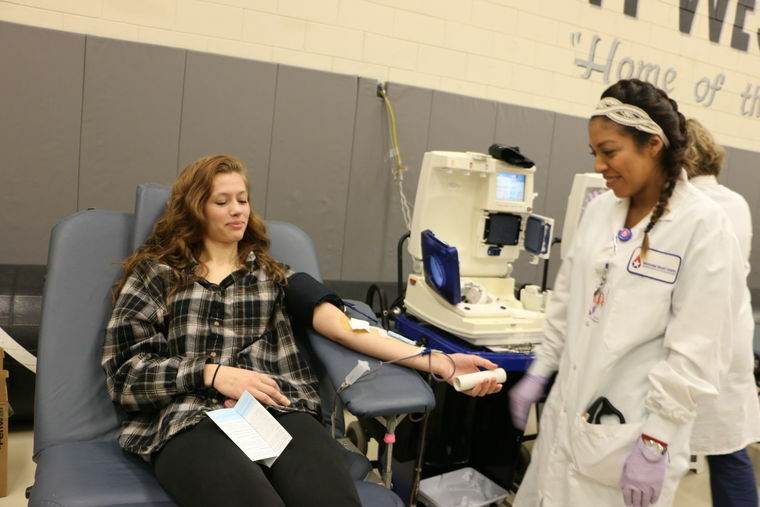 Read more about the blood drive in this article from the Independent Review. 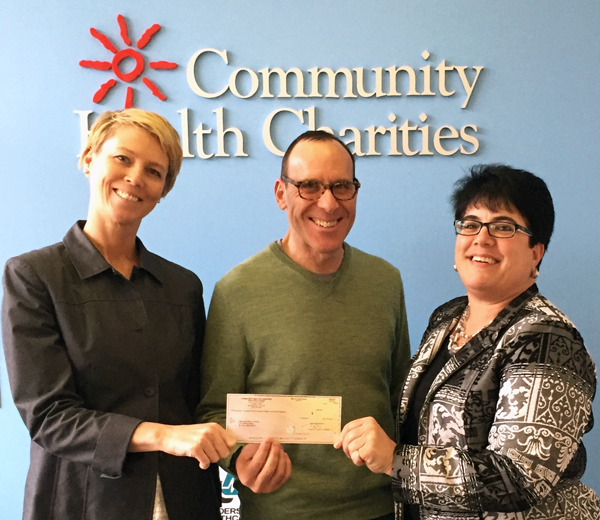 Jenna Berneck and Andrea Wendt of Community Health Charities (CHC) present Larry Silber with a special distribution of $17,516. 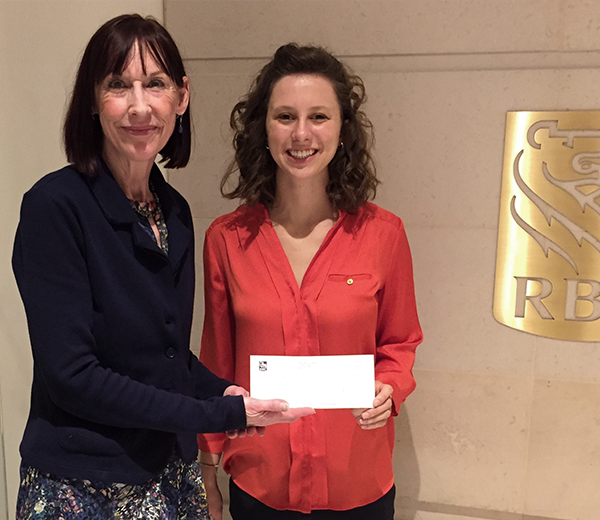 Liz Poland of RBC Financial presents Izzy Sullivan, Metro donor recruiter, with a check to support MBC’s High School Program. In addition to these grants, MBC also received a one-time distribution from Community Health Charites (CHC) of Minnesota for $17,516 as a result of a nationwide merger. MBC is one of 36 member charities that received an additional payout from CHC. IBR’s Sue Corby, Reagent Donor Program Assistant Manager; Angie Novotny, Reference Laboratory Manager; Sam Smith, Communications Coordinator; and Larry Silber, Marketing and Development Manager celebrate receiving funds from the Fred C. and Katherine B. Andersen Foundation by each holding a corner of the $60,000 check. With continued support from the foundation, MBC has grown our Apheresis Angels program to include over 1,000 platelet donors. In addition, we installed state-of-the-art DNA antigen testing equipment last year. This year’s funds will help us increase our registry of specially-typed Apheresis Angels donors. Donors in our Apheresis Angels program have undergone an additional typing procedure to identify special human leukocyte antigens (HLA). These donors have agreed to donate platelets—at a moment’s notice—to meet the needs of patients in need of special HLA markers. 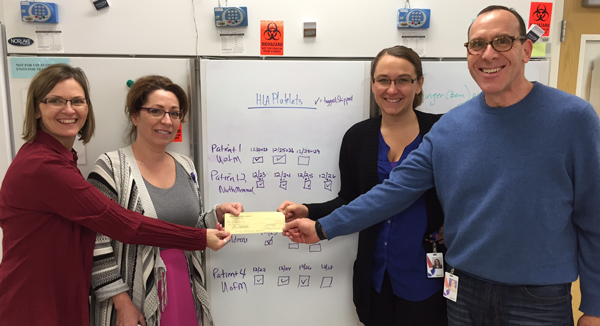 Some of our Apheresis Angels donors have also had an additional test to identify the HPA-1a-negative platelet. These platelets are extremely rare, present in just 2% of the population, and are the most effective treatment for newborns with a blood disorder called neonatal alloimmune thrombocytopenia. 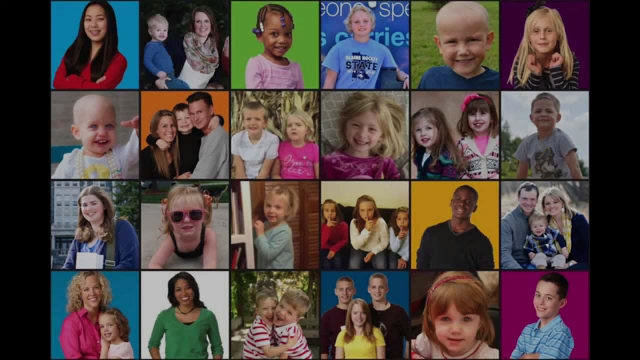 MBC is proud to say, with support from the Fred C. and Katherine B. Andersen Foundation, we have 70 HPA-typed donors. Collections now regularly schedules these donors so we always have a unit available for a pediatric patient in need. The Apheresis Angels program was created in 2007 in response to an increasing demand for specially-typed platelets for patients in need. 400 people rolled up their sleeves to support their favorite first responders during the 2015 Battle of the Badges competition. In August, fifteen teams of police and fire departments competed in a friendly life-saving competition to help increase awareness of the importance of blood donation. Winner: Rogers Police and Fire departments with nearly 17% of the donations. 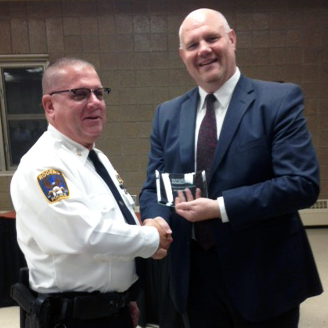 Rogers Police Chief Jeff Beahen accepted the Battle of the Badges award at the City Council meeting in November from MBC Donor Recruiter Jay Whitcomb. 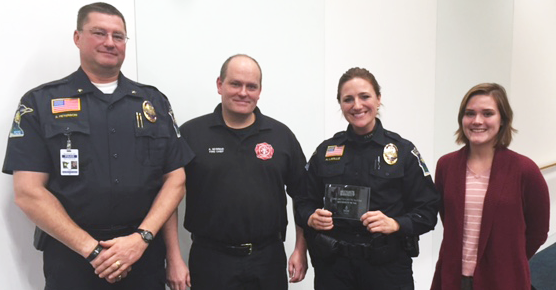 Rookie of the Year: Forest Lake Police and Fire Departments with 35 registered donors. Forest Lake Police Chief Richard Peterson, along with Fire Chief Alan Neuman, and Detective Ashley Lavalle accepted the Rookie of the Year award from MBC Donor Recruiter Tommie Hollingsworth. Learn more about the Battle of the Badges competition. Want to be featured in Circulation? We’re always looking for stories! Simply snap a picture and send it along with some facts to Marketing. Your picture might be featured in the next edition of Circulation! 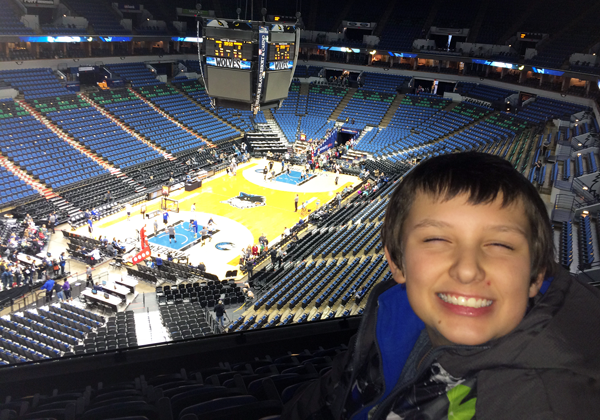 Kevin Sleen Jr., blood donor at Enbridge Energy, took his nephew to a Minnesota Timberwolves game in January. In November, MBC donors received a voucher redeemable for two Minnesota Timberwolves tickets, and had the chance to win a $200 Visa gift card. Congratulations to the Visa gift card winner, Jeff Bican, who donated at Thermo King | Ingersoll Rand’s Blood Drive. Thank you to all our blood donors who continue to help save lives through blood donation. Click the image above to start video or watch on MBC's YouTube Channel. Bloodmobiles carry more than blood—they carry hope to our families, friends, and neighbors in need. On Give to the Max Day in Minnesota, many gave generously to help keep the wheels on our bloodmobiles going ‘round and ‘round. With generous community support, and matching gifts from Hubbard Broadcasting Foundation, and Leo and Chris Stern, we raised $9,400 for MBC bloodmobiles. Throughout the year our bloodmobiles travel over 114,000 miles to over 1,300 businesses, organizations, civic groups, and schools to provide hundreds the opportunity to make a life-saving difference. 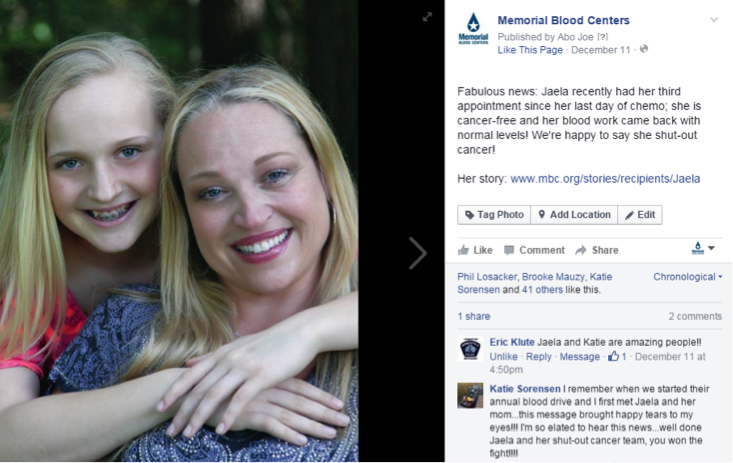 Copyright ©2016 Memorial Blood Centers. All rights reserved.